We all crave beautiful skin! Whether it’s a flawless complexion and radiant shine or just freeing ourselves from troublesome breakouts, skin health is a marker of overall health. While some of us might attribute skin problems like acne to stress, that’s an oversimplification. Skin issues can often indicate underlying vitamin deficiencies, gut health issues or even autoimmune diseases. Since I have two autoimmune diseases affecting skin, lichen planus and scalp psoriasis, as well as a history of cystic acne, eczema, dry skin, and pores you can see form space, I’ve worked hard over the years to perfect my own skincare routine. That means both identifying wonderful products that I love and cleaning up my diet to make sure I’m supporting it with all the nutrients it needs! 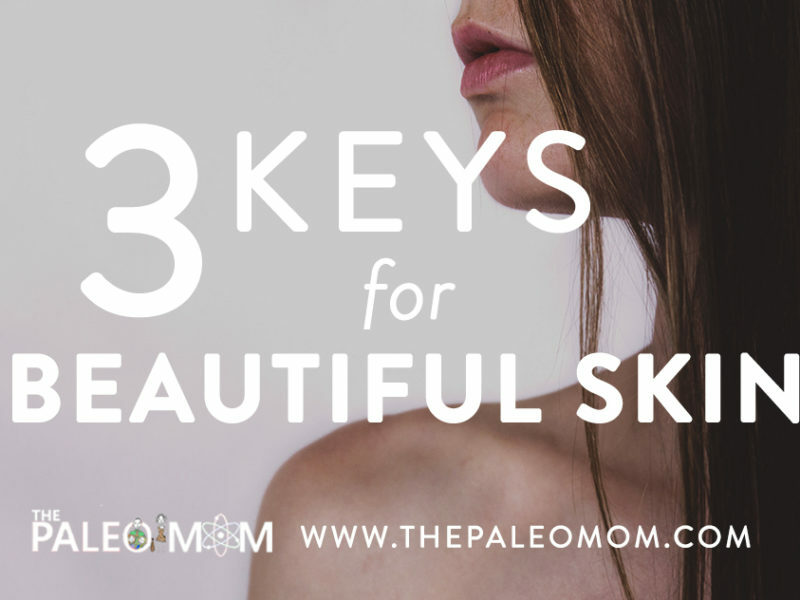 Here are three simple keys to giving ourselves the best skin possible! 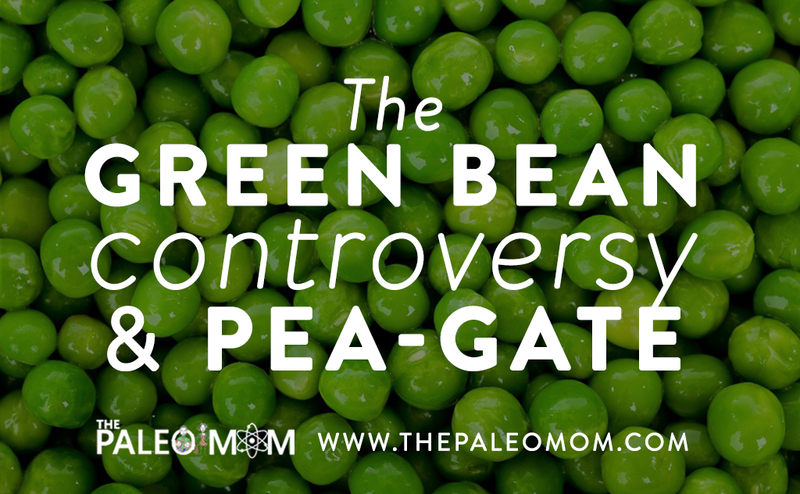 We often think of the Paleo diet as one that is centered on elimination. 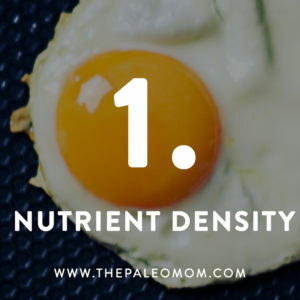 Sure, cutting out foods with harmful toxins is essential to success on the Paleo diet, but nutrient density is even more vital (see Lectins and the Gut, Omega 3 vs. 6 Fats, The Great Dairy Debate, and Saponins and Protease Inhibitors)! Think of it this way: many pricey “anti-aging” products tout the power of topical nutrients like collagen and Vitamins C and A, and there’s a reason—these nutrients are incredibly powerful in helping our cells regenerate quickly and speeding healing so our skin looks younger and plumper. But what if we could give our bodies the ability to generate enough of these nutrients ourselves? Let’s back up: what is nutrient density exactly? Nutrient density is the concentration of micronutrients (vitamins and minerals) per calorie of food. 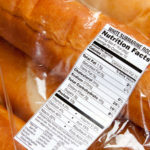 High nutrient density foods supply a wide range of vitamins and minerals (or alternatively, high levels of a specific, important vitamin or mineral) relative to the calories they contain, whereas low nutrient density foods supply lots of energy without much in the way of additional nutrition. Today, the Standard American Diet contains far too many low nutrient density foods that are high in added sugars, refined grains, and industrially processed oils, while also being stripped of the vitamins and minerals (and other health-promoting compounds) found in whole foods. As a result, recent scientific analysis of the diets of 16,000 Americans found that 70% of the population didn’t consume enough vitamin D, 34% didn’t consume enough Vitamin A, and 25% didn’t consume enough Vitamin C (see The Importance of Nutrient Density and 3 Ways to Up Your Nutrient Game). Scary right? Those were just some of the common deficiencies found in the study. When our skin is deficient in key nutrients, we might notice that it lacks brightness, sags or recovers from blemishes or other wounds more slowly. Vitamin A, in particular, is a key nutrient for cell regeneration (and one in which most of us are deficient!). Skin cell turnover requires vitamins, minerals, and amino acids that fuel our immune systems. More specifically, the animal form of vitamin A, called retinoic acid, is necessary for immune function, cell differentiation, and epithelial formation—all of which kick into high gear after tissue injury. You might recognize Vitamin A and retinoic acid as key ingredients in popular “retinol” creams. There’s a reason these are marketed as great “anti-aging” serums! If you want to look youthful without dropping a pretty penny on chemical creams, the best sources for increasing our Vitamin A consumption are animal foods such as liver, egg yolks, cod liver oil, and full-fat dairy products (see: Nutritional Support for Injury and Wound Healing). Vitamin A is also essential for the role it plays in delivering another key skin-loving nutrient, collagen, to the surface of our skin. 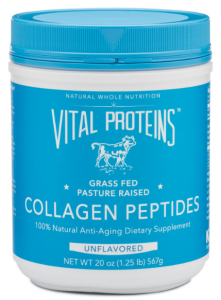 Collagen is a protein that makes up the connective tissues of animals, and happily, it’s also great for creating more youthful-looking skin! I love the ease of quick-dissolving Collagen Peptides from Vital Proteins, but bone broth is a fabulous source of collagen and its sister nutrient, gelatin, as well (see Why Broth Is Awesome and The Health Benefits of Bone Broth). Including Vital Proteins gelatin in recipes is a really fun way to nourish your skin while reaping the gut-healing benefits of this superfood. I’ve written quite a few recipes that include gelatin, such as my AIP-friendly vanilla ice cream and lemon “cheese” cake. Upping our intake of Vitamin C and Vitamin D can also help with skin cell regeneration. Vitamin C is an important antioxidant and plays a vital role in every step of the healing process. In fact, having deficient levels of Vitamin C can dramatically slow down our immune system’s efforts. Vitamin C helps synthesize collagen, optimize immune response, and usher monocytes to injured tissue, where they transform into macrophages and gobble up foreign (and potentially harmful) debris. Some of the best natural sources of Vitamin C include citrus fruits, tomatoes, broccoli, cauliflower, sweet peppers, dark leafy greens, cantaloupe, and papaya. Yum! Vitamin D deficiency is a problem for so many people these days (an estimated 75% of us!) and it isn’t just from lack of sun exposure anymore (although that does play a large role!). Research has shown that high-sugar diets can have devastating effects on our levels of Vitamin D (see: Fructose and Vitamin D Deficiency: The Perfect Storm? and 5 Nutrients You’re Deficient In If You Eat Too Much Sugar). Lowered vitamin D levels are associated with a higher risk of autoimmune disease and increased inflammation. This is bad news if you’re struggling with inflamed or reddened skin, or any autoimmune disease that causes damage to your skin. In order to up our Vitamin D game we can increase our sun exposure, eat more Vitamin D-rich foods like oily fish or egg yolks, ask our health care provider about the possibility of adding a supplement, and keep our fructose intake to below 40 grams of fructose from whole foods sources per day. Even if we’re happy with our skin, it’s a great idea to consider shoring up our nutrient stores in an effort to stay ahead of the curve! Eating for nutrient density is all well and good, but there’s no sense in pumping ourselves full of vitamins, minerals and other nutrients if our gut health isn’t optimized. That’s because a damaged gut isn’t capable of digesting and absorbing those nutrients. 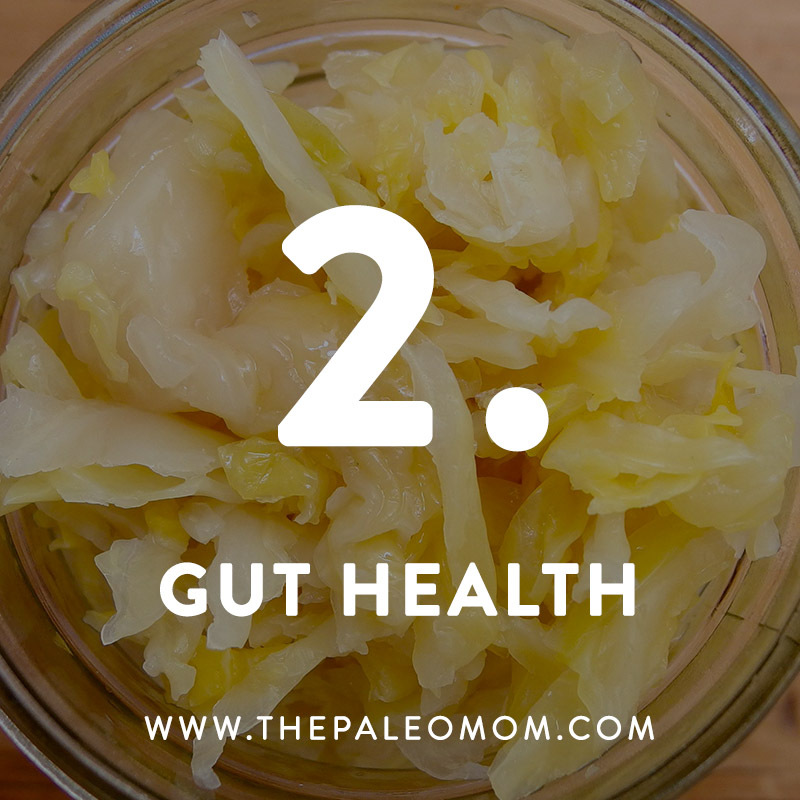 Gut health is vital to every single function in our body and is a major focus of the Paleo Diet. 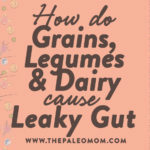 It’s one reason we focus so much on eliminating grains and legumes, which contain saponins and lectins that wreak havoc on our guts (see Lectins and the Gut and Saponins and Protease Inhibitors). This thinking also provides the basis for the common elimination of dairy. There is also a super strong link between the hormones in our gut and our brains and vice versa. That’s why when we are experiencing a lot of stress or excess emotion our stomachs can become upset. 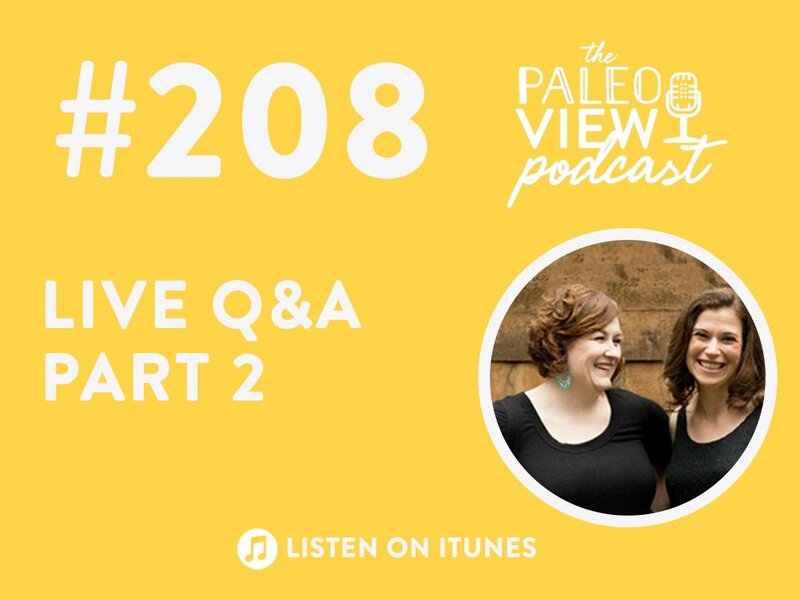 Strong negative emotions like stress, depression, and anxiety contribute to leaky gut—which in turn can cause issues in our skin (see TPV Podcast, Episode 64: Will Paleo Help Me? and How Mood and Gut Health Are Linked). Gut health isn’t only key because it allows us to absorb skin-healing nutrients—a leaky gut can actually contribute to a whole host of skin conditions (not the least of which are autoimmune skin conditions like psoriasis and lichen planus!). Eczema, which affects 10-20% of infants and about 3% of adults in the US (see Eczema), is associate with a higher prevalence of leaky gut, and the latest research demonstrates that a “leaky” skin barrier may actually be the main cause of this condition. Eczema is a general term used to describe a collection of skin conditions (the most common being atopic dermatitis) in which the skin is inflamed and irritated. If we’re suffering from eczema, we might see redness, skin edema (swelling), itching, dryness, crusting, flaking, blistering, cracking, oozing, or bleeding. 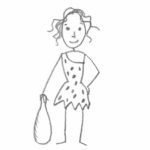 Most people see a reduction in eczema symptoms when they follow a Paleo diet, and consuming Omega-3’s from fatty cold water fish can be a powerful way to reduce inflammation in this condition. If you suspect impaired digestion or see other signs of a leaky gut on your skin, it’s important to test at home (see 5 Gut Health Tests You Can Do At Home). 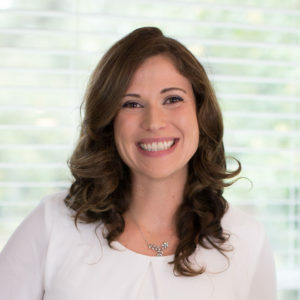 The good news is that, while it can take quite a bit of time, repairing the gut is completely possible and often attainable on your own (see Repairing the Gut). 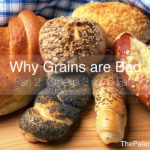 The first step is making sure to follow a strict Paleo diet by eliminating the harmful lectins found in grains and legumes and drastically limiting (preferably eliminating) dairy consumption. We should also make sure to keep our consumption of omega-3 fatty acids high by eating wild-caught fish. We can also help digestion by adding more fermented foods into our diets. Fermented foods are an amazing source of probiotics which can work wonders on replenishing our gut microflora and regulating digestion. Some of the easiest fermented foods to incorporate into our diets are raw, unpasteurized, fermented vegetables (sauerkraut, kimchi, pickles, beets, carrots); raw, unpasteurized, fermented fruits (chutneys, jams, green papaya, pickled jackfruit); water kefir; and coconut milk kefir. Those are just a few of the easiest ones to find and incorporate, but there are dozens more that all have unique benefits for our gut (see The Health Benefits of Fermented Foods). Another great step to regulating our gut health is making sure that we are getting a mix of soluble and insoluble fiber. It is important that we are eating strong sources of a mix of fiber in order to make our gut bacteria as healthy as possible. Healthy gut bacteria do amazing things for our bodies, including helping to repair leaky gut, aiding in digestion, and helping to regulate our immune systems. 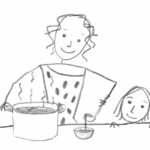 For more information on the awesome benefits that fiber can have see: The Fiber Manifesto–Part 1 of 5: What Is Fiber and Why Is it Good? which is the first in my super informative five part series all about fiber! Finally, adding in plenty of gut-healing broth (or supplementing with collagen or gelatin) is essential. The gylcine content in gelatin, collagen and bone broth are powerful gut-healing nutrients. Just as these powerhouses are great for wound healing, they can help regenerate the tight junctions between epitheleal cells in the gut, which are opened in the case of leaky gut. Now that we’ve talked through the myriad ways w can improve our skin from the inside out, it’s time to discuss the really fun stuff: what we put ON your skin! As you might imagine, it’s very important to make smart choices when considering our skincare options. Part of my own journey has been selecting the skin, hair and makeup products that give me the best results without compromising quality. That means I don’t want to use chemically-laden products just because they last a few hours longer or can be purchased at my local drug store. Since the chemicals added into many traditional beauty products are directly absorbed through our skin into our bloodstream, it’s very important to pay attention to the ingredients in our skincare. That’s especially true if you’re struggling to improve your skin! Through LOTS of trial and error, I’ve landed on a few GREAT, safer skincare companies whose products I use and love. 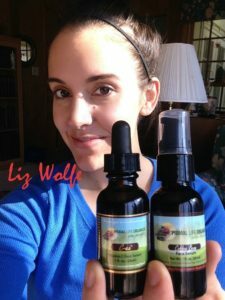 Primal Life Organics products have been some of my favorites for years. In fact, their Coffee Bean Serum and C-Ex Serum (developed with Liz Wolfe!) have absolutely saved my skin a number of times when I’ve been tired, stressed or just looking for a little boost. I also love the Torn Up Skin Repair when I need to rehab my hands after a tough workout! My favorite thing about PLO is that each and every ingredient is totally recognizable as a natural product. Plus, you can rest easy knowing that those real-food ingredients—because I really do think of PLO as “skin food”—are mixed fresh by hand when you order. That’s seriously cool! Primal Life Organics has products for the face, body, for men, acne, and even their own line of SERIOUSLY clean and organic makeup. These products are made entirely of clays, foods, flowers, and herbs and are exactly the natural skin care solution we should all be looking for! 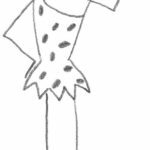 For more information see The Paleo View (TPV), Episode 34: Healthy Hair, Skin, and Teeth. I recommend you try out the Coffee Bean and C-Ex Vitamin C Serums which you can get bundled in the Coffee Bean and C-Ex Revival Package! 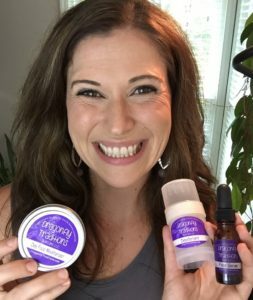 Araza Natural Beauty is a 100% Paleo, all-natural makeup line I have been LOVING lately (especially when I need to go on camera!). Founders Lindsey and Jen, who suffer from Celiac Disease, became frustrated when they couldn’t find products to fit their Paleo lifestyle. So they decided to create them on their own! Araza is crafted around the idea that what we put on our bodies is as important as what we put in it, and uses pure, natural ingredients I can really get behind. That means it’s based on healthy fats, organic plant-based ingredients and minerals and free of gluten, dairy, soy and artificial ingredients. Araza is the first Certified Paleo color cosmetic line. How cool is that!?! Plus, Araza makes my skin look amazing and super-professional! This is one of my favorite new product finds of the last year! 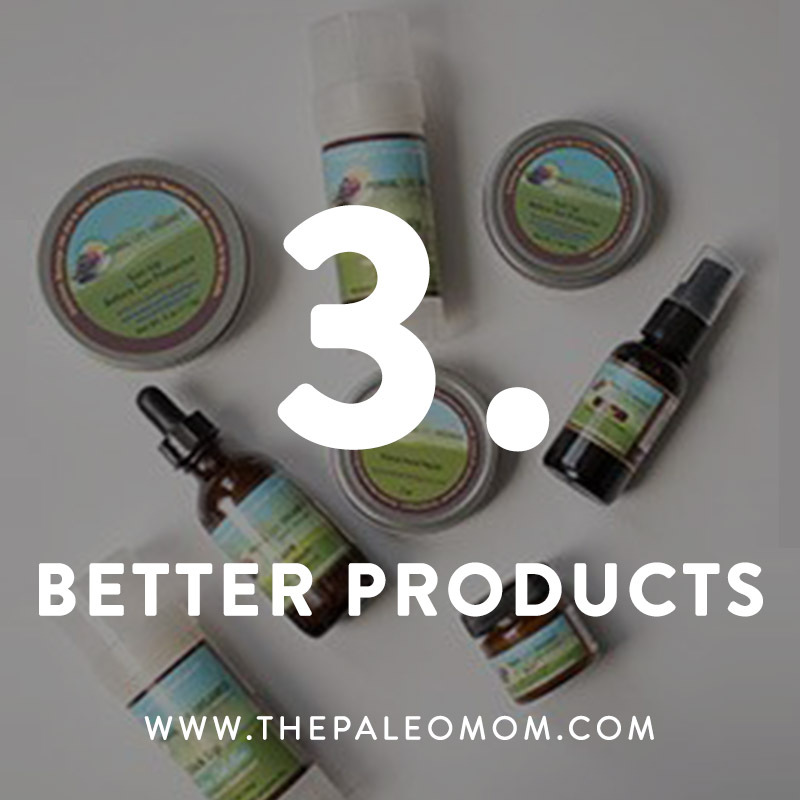 Buffalo Gal’s nutrient-dense line of tallow-based skincare is perfect for sensitive skin. I love the Tallow Balm for everyday use, the Eye Revive and FaCe Revive Night Balm, and the Tallow and Emu Balm for moments when my skin is driest. I can’t wait for founder Shalley to release her new line of deodorant, too! What about a brown tone to skin under the arms? Hi Sarah, For natural skin care products, you should check out Seed to Serum. An excellent site for organic, artificial chemical free skin care. I wonder what you think of using nightshades externally, ie. A homemade cayenne salve for aching muscles if you are AIP? Hi, have you found any natural cream that works as well a steroid cream for eczema type of issues? My baby & I both have it pretty bad & it gets so itchy to the point of driving us nearly crazy. So I use a steroid cream on myself. Not on my baby because I just can’t stand to use that on him but it’s also very hard for me to see him scratch & bleed :'( I have yet to find something natural that helps, especially with the itchiness! Luminance Skin Care is fabulous. Check them out too! Love their shampoo and sunscreen and well every item I have tried. Amazing!